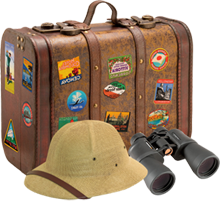 ﻿Why hold a CREATION SEMINAR SAFARI at your church or organization? It's also important because of so much confusion generated by the compromises that are being made that completely dilute the message of biblical creation. Additionally, there are many people who ask basic questions about life - Is there a God who created everything?...or did all living things evolve through random, natural processes? It's a reasonable question since it strikes at the very essence of our being. Why am I alive? What is the meaning of life? If there is a deeper meaning, what really happens when I die? The theory of evolution proposes to answer the questions without the need for God, and since it is the only option taught in the public school system, natural history museums, many TV programs, etc., it has become widely regarded as fact. But, is it? Many scientists today are questioning that idea. It has been over 160 years since Charles Darwin's book, Origin of Species, was published. Testing many aspects of the theory have actually yielded data which indicates that Darwinian evolution (increased complexity) is quite impossible, and it certainly is not observed to be happening. This has led to the rise of the "Intelligent Design" movement. While it is certainly a step in the right direction in that it points away from evolutionary dogma, it doesn't specify the "who, what, when, or how" of life. At best, evolution provides a biblically incorrect and scientifically flawed explanation of the origins of complex life on Earth. At worst, it provides a “license” for people to live any way they choose to live since it presupposes no Creator. This, in turn, produces a society that has no roots or practical definition for truth, values, or moral standards. This “safari” is designed to cover, not only the “big game” issues (including the fossil record, dinosaurs, the global flood, “ape-men”, ancient civilizations, etc. ), but also a wide array of others. The seminars promote a very clear understanding of the scientific problems regarding evolutionary theory, and educate people regarding the whole topic of the biblical creation model, which includes the fall of man, the flood of Noah's day (including its causes and effects! ), the events at Babel, the importance of the Genesis record, etc. The safari is informative, thought-provoking, and enjoyable. It will equip people to deal with these issues in a realistic and biblical manner. Contact us to book the adventure! What are the seminars like? These are not dry lectures. Our "nuts-and-bolts" approach is to make this as interesting and understandable as possible so the information will be remembered. 1. That our travel expenses (mileage, hotel, etc.) are covered. 2. That opportunity is made for people to donate to us through a love offering, should they choose to do so. 3. That we can set up a display table for the sale of books and DVDs. This schedule can be altered in any way convenient for you. The sessions vary in length from 30-60 minutes.